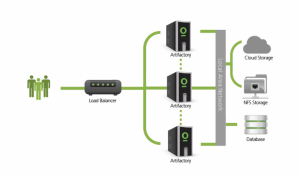 With an Enterprise license, Artifactory supports a High Availability network configuration with a cluster of 2 or more, active/active, read/write Artifactory servers on the same Local Area Network (LAN). This offers a level of stability and availability that is unmatched in the industry. The Artifactory HA redundant network architecture means that there is no single-point-of-failure, and your system can continue to operate as long as at least one of the Artifactory nodes is operational. This maximizes your uptime and can take it to levels of up to “five nines” availability. By using a redundant array of Artifactory server nodes in the network, your system can accommodate larger load bursts with no compromise to performance. With horizontal server scalability, you can easily increase your capacity to meet any load requirements as your organization grows. By using an architecture with multiple Artifactory servers, Artifactory HA lets you perform most maintenance tasks with no system downtime. For most tasks, while one node is undergoing maintenance, the other nodes remain live and handle all requests to the system resulting in zero downtime.